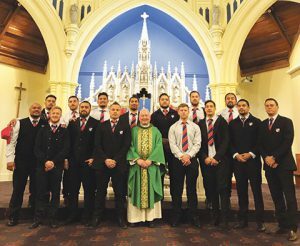 WelCom December 2017: Marist St Pat’s Rugby Club patron Fr Barry Scannell sm celebrated Mass for the team at St Mary of the Angels Church, Wellington, in October. 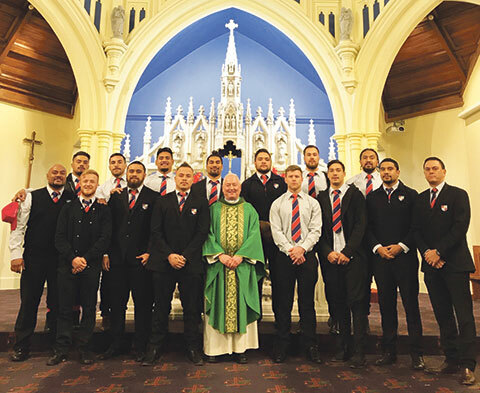 As the Mass was about to end Fr Barry asked the captain, Valentine Meachen, to bring the team up onto the altar to receive his blessing for defeating the 2016 champion team Old Boys University and to bless them for their semi-final game against Hutt OB Marist the following Saturday. Unfortunately, Marist St Pat’s lost to Hutt OB Marist and OB University beat Hutt OB Marist in the final. Marist St Pat’s greatly appreciates Fr Barry’s support for the teams and the club supporters. Special thanks also to Fr Barry for his support at the recent funeral of Leo Buchanan, a long-time strong MSP supporter.